New Street comes alive every first Wednesday of the month with Birmingham city centre's first instalment of the Farmer's Market. Scents of tikka spices from The Spice Guys, toasted sandwiches from Jabberwocky, and the sight of large, locally made pies, always gets my attention. You can tell the goods on show have been made with love and passion, and not just because they look good; every single market trader was beaming as they waxed lyrical about their consumables. Not least KusKusFoods owner Moses. The play on words isn't accidental: KusKus is a play on the popular grain cous cous, mostly used in the place of rice, or potatoes in many Middle Eastern dishes. Morocco, the UAE, and Asia have inspired the menu and ethos behind KusKusFoods. I love it when people who are selling their brand don't have to twist your arm – KusKus is that in a nutshell. Moses seemed to echo my thoughts as he told me the ethos behind KusKus is whole, home-made, organic food which happens to be vegan and vegetarian. He said he has a gripe with the stigma attached to 'healthy' eating, and is frustrated that people feel the need to preach about figures, facts, and put a label on their diet. Instead of claiming a vegan or vegetarian title, KusKus is simply described as healthy vegetarian food inspired by the Middle East. KusKus travels around the UK, actively avoiding the mass market, turning down supermarkets, and favouring a modest approach, making noise in the right places and supplying independent companies with his yummy falafel mixes. 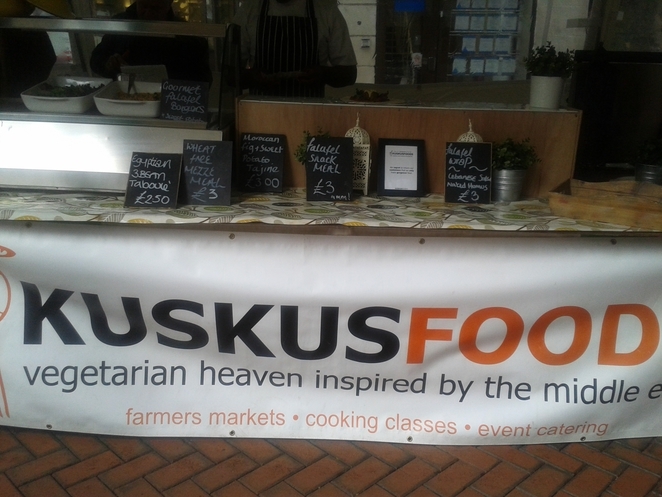 Personally I'm not a fan of falafel – I find it quite dry and cake – but KusKus' is definitely different. 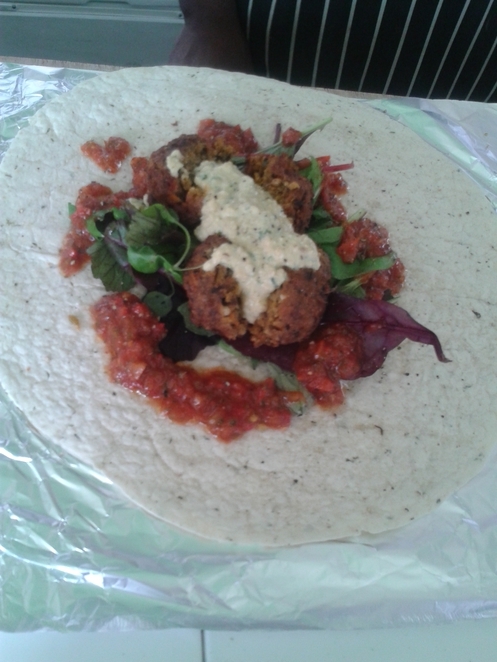 The mix is slightly moist, so if you like falafel, you'll love it. I however, couldn't manage more than two bites, even coupled with the home made hoummus and salsa. 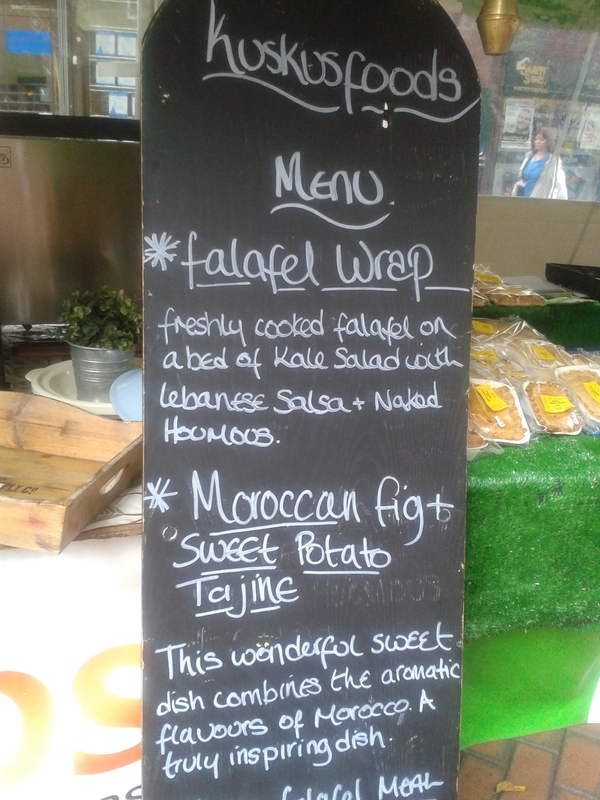 We had a very interesting chat about the food industry, organic produce, rules and regulations, all whilst Moses served customers with his freshly made, hot, falafel wraps (£3.00). Find them next at the Malvern Art and Food Market (5th October, 16th November), they're in Oxford over the weekend, or come to New Street next month; be ready to form a line because by 2.30pm he's sold out. Two of the stipulations of holding a stall at Birmingham's Farmers Market include the use of two local ingredients, and Moses confided that his friend (who has an allotment) provided him with 2kg of tomatoes. Tomatoes are also in season, and Moses tries to use garden-grown vegetables in the rest of the dishes, so munching on a falafel wrap, or hand-made samosa, is good for the soul as well as your tummy.